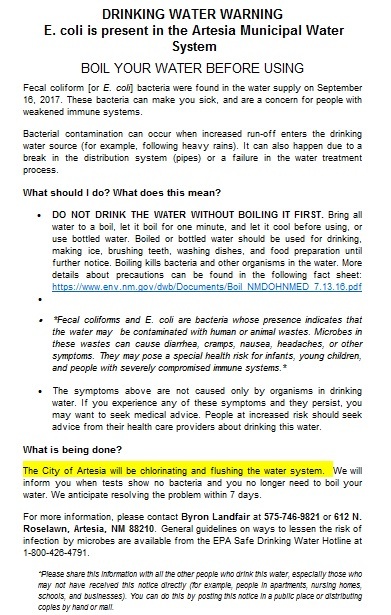 The City of Artesia’s water system has once again received a positive test result for E. coli, the city reported this afternoon. Artesia will be under a boil water alert, issued by the New Mexico Environment Department’s Drinking Water Bureau, until two consecutive days’ worth of clear test samples have passed. The Artesia Public Schools have confirmed they will be closed Monday and Tuesday due to the boil water alert. The APS will meet Monday with the City of Artesia and the Department of Health, and will issue an update Monday afternoon regarding whether classes will resume Wednesday. The City of Artesia, in compliance with the Drinking Water Bureau, a division of the New Mexico Environment Department has initiated a Boil Water Alert to be followed by all city water users effective at 3:00 PM on Saturday, September 16. This alert will remain in effect until further notice. On Thursday, September 14, the City received results on routine water samples taken on Wednesday. One positive result for e-Coli was received among the eight samples. The State of New Mexico Environment Department was notified and a second round of samples was taken and sent to the lab on Friday. The test results on these samples were received today confirming a positive result for e-coli. Consequently, the Boil Water Alert has been initiated and will remain until all traces of e-coli bacteria are eradicated. Additional samples will be taken daily for testing until the issue is resolved. Under the Boil Water Alert water that is used for drinking, cooking or for washing fruits and vegetables must be boiled for a minimum of one minute before using. The water remains safe for bathing, showering, watering plants and lawns and washing clothes. Ice made using water from the City water system should not be used. This includes residential ice makers as well as commercial and restaurant ice. Ice made using water from outside of Artesia should be safe for consumption. City Water Department personnel are working extended hours to identify and eliminate the source of the problem. Other City personnel are making contact with and monitoring senior citizen residents, nursing home facilities, meal site and daycare centers to assure these are following the alert procedure and have ample supplies of bottled water. Artesia residents with hardships or who are unable to secure a water source should call 575-748-0267 for City personnel to respond. Additional information about a Boil Water Alert can be found on line at www.env.nm.gov/dwb/Documents/boil .